지난 12월 2일부터 4일까지 2018 무장갈등예방을 위한 글로벌파트너십(GPPAC) 동북아 회의 <동북아시아에서의 평화 구축>이 중국 베이징에서 열렸다. 이번 회의는 2015년 이후 매년 정기적으로 열리고 있는 한반도·동북아 지역의 평화와 안정에 대한 민간대화(트랙 2)인 ‘울란바토르 프로세스’의 네 번째 대화로 진행되었다. 남한과 북한을 포함한 6자 회담 국가들(중국, 일본, 러시아, 미국)과 몽골의 시민사회 인사들이 참여하고 있으며 남한 시민사회단체로는 참여연대와 평화를만드는여성회가 참여했다. 회의 참가자들은 평창올림픽을 계기로 지난 1년 사이 한반도를 둘러싼 환경이 급변한 상황을 크게 환영하며, 이러한 대전환은 1년 전에는 상상조차 할 수 없던 일이라고 강조했다. 참가자들은 남북 정상회담, 관계 개선을 위한 다양한 협력, 북미 정상회담뿐 아니라 관련국들 간의 관계 개선에 주목하며, 한반도 평화 프로세스에 대한 전 세계의 관심과 기대, 희망이 커지고 있다고 강조했다. 이러한 맥락에서 한국 전쟁 종식, 관련 국가들의 관계 정상화, 평화협정 체결 등 한반도 평화체제 수립을 위한 시민사회의 역할에 대해 논의하고, 동북아 비핵지대 건설의 필요성에 대해서 토론하였다. 이어 참가자들은 한반도와 동북아의 평화가 전 세계적으로 중요하다는 데 공감하고, 시민사회가 한반도와 동북아 평화 구축에 기여할 수 있는 보다 구체적인 활동 계획에 대해 토론하였다. 구체적으로 정기 회의 진행 외에 핵심 주제별 실무 그룹 구성, 주요 계기를 활용한 공동 행동 등을 논의하였으며, 앞으로도 지속적으로 한반도와 동북아 평화를 위해 회원 단체들간의 다양한 협력을 해나가겠다고 밝혔다. ▣ 무장갈등예방을 위한 글로벌파트너십(Global Partnership for the Prevention of Armed Conflict, GPPAC)이란? 설립배경 : 2003년 설립. 2001년 무장갈등 예방 보고서를 작성하면서 시민사회와 소통했던 코피 아난 전 유엔 사무총장이 갈등 예방과 평화 구축에 있어 글로벌 네트워크의 필요성을 절감하고 설립을 지지함. 설립목적 : 지역사회(local), 국가(national), 지역(regional), 글로벌 평화와 안보를 위해 활동하는 시민사회와 정부, 유엔, 그 밖의 역내 기관들 간 네트워크 강화를 위해 설립. * GPPAC 서울에는 참여연대, 평화를만드는여성회, 아리(ARI), 동북아지역평화구축훈련센터(NARPI)가 회원단체로 활동하고 있음. 2018년 12월 2일부터 4일까지 무장갈등예방을 위한 글로벌파트너십(GPPAC) 동북아 회의 <동북아시아에서의 평화 구축>이 중국 베이징에서 개최되었다. 이번 회의는 한반도·동북아 지역의 평화와 안정에 대한 민간대화인 ‘울란바토르 프로세스’의 네 번째 대화로 진행되었다. GPPAC 동북아시아는 설립 이후 동북아시아의 평화와 안보에 대한 전망을 교환하고 시민사회 간의 협력과 교류를 논의하여 보다 평화로운 동북아시아를 만드는데 기여하고 있다. 2015년 이래 GPPAC 동북아의 최우선 활동은 ‘울란바토르 프로세스’로, 몽골 시민단체인 블루배너(Blue Banner)가 공동 주최하고 있다. 울란바토르 프로세스는 동북아시아의 평화와 안정을 위한 민간대화로 역내 제도화된 평화안보 메커니즘 발전을 위해 효과적인 트랙2 대화를 만들어가려고 노력하고 있다. 트랙2 대화는 정부 간 절차를 보완하는 장치로서 시민사회의 역할을 강화하기 마련된 것이다. 올해 회의는 중국 베이징에서 개최되었으나 지난 2015년, 2016년, 2017년 3차례의 회의는 몽골 울란바토르에서 개최되었다. 무장갈등예방을 위한 글로벌파트너십(GPPAC)은 분쟁 예방 및 평화 구축 분야에서 활동하는 전 세계 시민 단체로 구성된 네트워크다. 코피 아난 전 유엔사무총장의 제안에 따라 설립되었으며, 2005년 공식적으로 발족하였다. 글로벌 사무국은 네덜란드 헤이그에 위치해있으며, 15개 지역 네트워크로 구성되어 있다. GPPAC 설립 이래, GPPAC 동북아시아 사무국은 일본 도쿄에 있는 피스보트(Peace Boat)가 담당하고 있다. 베이징에서 개최된 올해 회의는 외교 및 국제 관계에 중점을 둔 독립적인 비정부 싱크탱크인 중국 자하르 학회(The Charhar Institute)가 공동 주최하였다. 자하르 학회는 중국 정부와 국제 사회에 미래 지향적이고 독창적이며 건설적인 연구와 분석을 제공하고 있으며, 국내외 다른 싱크탱크와도 다양한 계기를 통해 정기적으로 협력하고 있다. 올해 회의에는 GPPAC 글로벌 사무국(헤이그), GPPAC 동북아 사무국(도쿄), 미국, 베이징, 교토, 도쿄, 평양, 서울, 울란바토르, 블라디보스토크의 회원 단체와 파트너들이 참여하였다. 구체적으로, 풀뿌리 평화 단체, 페미니스트 그룹, 언론 관계자, 평화군축 전문가, 인도주의 활동가 등 다양한 사람들이 참여하였다. 올해 회의는 한반도와 동북아 평화 정세가 급변하고 전례 없는 모멘텀들이 만들어진 상황에서 개최되었으며, 참가자들은 한반도의 변화된 상황에 큰 박수를 보냈다. 지난 2017년 8월 울란바토르 프로세스는 한반도 위기 상황에서 개최되었기에 참가자들은 평창 동계 올림픽의 남북 단일팀 구성, 이어진 남북 정상회담 및 구체적인 협력 방안 논의, 북미 정상회담 등 한반도 평화와 관련된 긍정적인 조치가 2017년 회의 당시에는 상상할 수 없던 일이라고 강조했다. 뿐만 아니라, 참가자들은 미중 관계, 중일 관계, 러일 관계 등 관련 국가들의 관계 개선에 주목했다. 한반도 평화 프로세스에 대한 세계의 관심과 기대, 희망이 커지고 있다. 역내 상황을 고려하여 이번 회의에서는 한국 전쟁 종식, 관련 국가들의 관계 정상화, 평화협정 체결 등을 포함한 한반도 평화체제를 위한 환경을 어떻게 지원할 것인가에 초점을 맞추어 논의하였다. 또한, 미국의 ‘최대의 압박과 관여’ 정책과 유엔 안보리의 대북 제재가 대북지원활동 등에 실질적으로 미친 영향을 포함하여 상황 변화에 미친 영향 등에 대해서도 토론하였다. 참가자들은 핵 개발과 관련이 없는 북한 주민들의 인권을 침해하는 경제 제재를 적어도 부분적으로 완화하거나 해제해야 한다는 의견에 동의하였다. 이번 회의에서는 '안보'의 정의에 대한 많은 논의들이 이루어졌다. 안보를 특정 국가의 이익과 필요에 근거한 제로섬 게임이라고 정의하는 것에서부터 누구의 안보가 실제로 지켜지는지를 고려하는 동시에 모든 이해관계자들의 필요를 고려하는 공동 안보 개념이 되어야 한다는 것까지 다양한 토론이 있었다. 이러한 맥락에서 몇몇 발표들은 안보 이슈에 대한 여성주의적인 관점이 지역적 맥락에서 어떻게 작용할 수 있는지에 대한 생각을 공유했다. 또한, 일부 참가자들은 일본 평화 헌법 9조의 유지는 이러한 맥락에서 매우 중요하다고 강조하였으며, 시민사회가 지역 영토 분쟁 문제를 지속적으로 모니터링 할 필요가 있다고 강조했다. 비핵화의 정의에 대한 다양한 의견을 포함하여 시민사회가 동북아 비핵지대 건설을 위한 환경에 어떻게 기여할 수 있는지, 핵 확산 방지를 위해 어떤 조치가 필요한지, 노벨평화상을 수상한 국제핵무기폐기캠페인(ICAN)의 활동으로 지난 2017년 유엔에서 채택한 핵무기금지조약(TPNW)을 어떻게 활용할 것인지 등 비핵화의 우선 과제에 특히 주목했다. 또한, 동북아 지역의 평화와 안보를 위한 활동에서 청년 그룹의 참여, 한반도의 지속가능한 평화를 보장하기 위한 성 평등의 필요성, 여성들의 중요한 역할 등에 대한 논의도 진행했다. 참가자들은 이번 회의를 통해 한반도와 동북아의 평화가 동북아 뿐만 아니라 전 세계적으로 중요하다는 점을 확인하고, GPPAC 글로벌 네트워크가 이를 지원하기 위해 최선을 다하고 있다는 점을 강조했다. 참가자들은 지속적으로 GPPAC 네트워크를 활용하고, 시민사회가 평화에 기여하는 보다 구체적인 활동을 하기 위해 노력할 것을 확인했다. 참가자들은 다양한 활동과 이니셔티브를 제안하며 2019년 GPPAC 동북아시아 활동 계획과 중장기 목표를 확인했다. 참가자들은 정기 회의 진행과 핵심 주제별 실무 그룹 구성을 포함하여 울란바토르 프로세스의 구체적인 다음 단계에 대해 논의하였다. 여성과 청년의 참여뿐 아니라, 미국과 유럽 국가에서 참여할 수 있도록 네트워크를 확장하는 것에 대한 공감대를 마련하였다. 나아가 3.1절 100 주년, 4.27 판문점 선언 1주년, 5월 24일 평화와 군축을 위한 세계 여성의 날 등 주요 계기를 활용한 기존 남북 합의 이행 촉구 등 한반도 평화와 관련된 공동 애드보커시 활동, 공동 성명 등이 언급되었다. 또한, 유럽과 미국에서의 광범위한 애드보커시 활동을 위해 GPPAC의 글로벌 네트워크를 활용하는 방법도 논의되었다. 북한에 대한 상호 이해 증진과 시민 교류 확대의 필요성이 강조되었으며, 이를 위해 평양에서 평화 대표단을 파견하거나 세미나를 개최하는 등의 구체적인 활동도 제안되었다. 올해 안으로 GPPAC 동북아 활동 계획을 결정하고, 한반도와 동북아 평화 구축에 기여할 시민사회단체의 구체적인 활동을 확정하기 위한 후속 논의가 계속 진행될 예정이다. 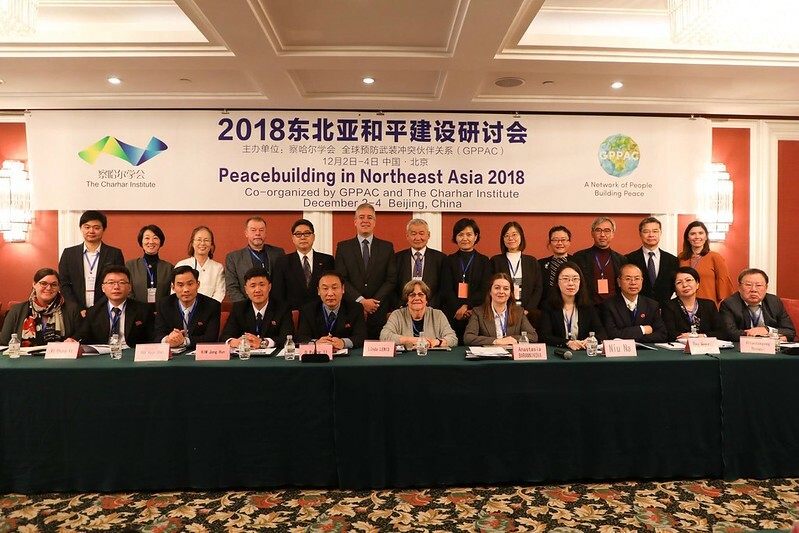 The Global Partnership for the Prevention of Armed Conflict (GPPAC) Northeast Asia Regional Meeting – Peacebuilding in Northeast Asia was held in Beijing, People's Republic of China between December 2-4, 2018. This meeting comprised the the fourth convening of the Ulaanbaatar Process, a civil society dialogue on peace and stability for the Korean Peninsula and broader Northeast Asian region. Since its foundation, GPPAC Northeast Asia has annually convened a meeting of its members from throughout the region to exchange perspectives on developments relating to peace and security in Northeast Asia, and discuss cooperation and exchange between civil society organisations to contribute to a more peaceful environment. Since 2015 the priority activity of the network has been the Ulaanbaatar Process, co-convened with the Mongolian NGO Blue Banner. This civil society dialogue for peace and stability in Northeast Asia promotes effective regional Track 2 dialogue, seeking to strengthen the role of civil society as a complement to governmental processes, towards the development of an institutionalized regional peace and security mechanism for Northeast Asia. Prior to this week's gather in Beijing, three meetings have been held thus far, annually in 2015, 2016 and 2017, each time in the Mongolian capital of Ulaanbaatar. The Global Partnership for the Prevention of Armed Conflict (GPPAC) is a member-led network of civil society organisations active in the field of conflict prevention and peacebuilding across the world. GPPAC was founded upon the proposal by former United Nations Secretary General Kofi Annan, and officially launched in 2005. It is structured around 15 regional networks, with its Global Secretariat located in the Hague, the Netherlands. Since GPPAC's foundation, the Tokyo-based NGO Peace Boat has served as the Regional Secretariat for Northeast Asia. In Beijing, the meeting was locally hosted by the Charhar Institute, an independent, non-governmental think tank in China focusing on diplomacy and international relations. The institute works to provide the Chinese government and the international community with forward-looking, original and constructive research findings and study analyses, and conducts regular cooperation, exchange and dialogue with other domestic and foreign think tanks through its publications, theme events and media. 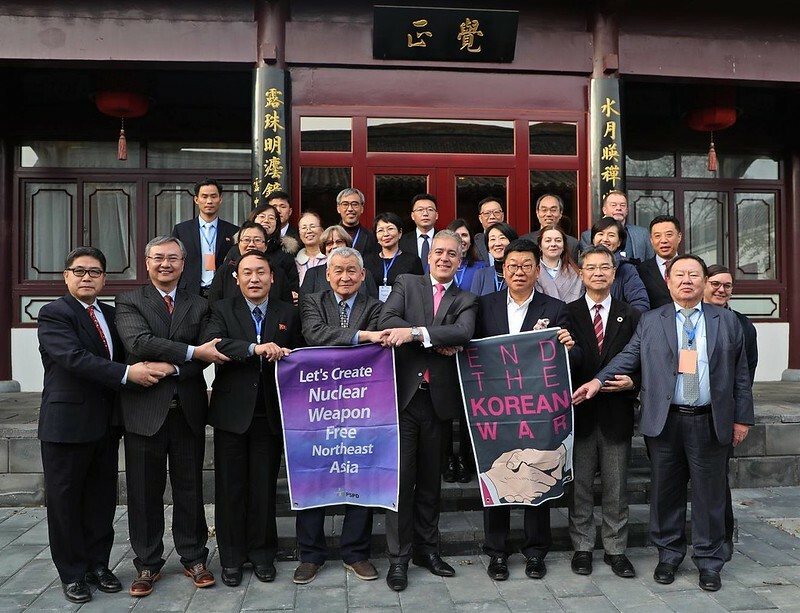 Approximately 30 participants joined the meeting, including from the GPPAC Global Secretariat (the Hague), GPPAC NEA Regional Secretariat (Tokyo), and network members and partners from Beijing, Kyoto, Pyongyang, Seoul, Tokyo, Ulaanbaatar and Vladivostok, as well as the United States. This included a range of actors including grassroots peace organisations, feminist groups, media commentators, peace and disarmament experts, humanitarian practitioners and more. The meeting took place following a year of rapid changes and an unprecedented momentum for peace on the Korean Peninsula and in the broader region, greatly applauded by participants. With the last Ulaanbaatar Process having taken place in August 2017, amidst a real crisis situation, participants noted that these positive steps are more than any could have imagined at the time of previous convening. Such steps include the joint Korean team at the PyeongChang Winter Olympics, the subsequent inter-Korean Summits and concrete steps for collaboration, and DPRK-US Summit. And in the broader region, participants noted other developments such as those in US-China, China-Japan and Russia-Japan relations. With this the world's attention is turned towards developments on the Korean Peninsula, placing higher expectations and hopes for the ongoing peace process. Given this regional context, the priority issue discussed was focusing on how to support the current environment for a peace mechanism on the Korean Peninsula, including bringing an end to the Korean war, normalisation of relations between related countries, and the replacement of the armistice regime with a peace treaty. The policy of related governments to these developments was also discussed, including the United States policy of “maximum pressure” and so-called “maximum engagement”, and the impact this policy and UNSC sanctions on real engagement, including humanitarian activities. Participants expressed that economic sanctions not related to weapons of mass destruction development capacity but which instead violate the human rights of ordinary people in the DPRK should be eased or lifted, at least partially. Considerable discussion took place on definitions of security, moving from that which is based on a zero-sum game of interests and the need to think of shared or common security, which takes into account the needs of all stakeholders, considering whose security is actually being defined. In this context, several presentations shared insight as to how aspects of a feminist perspective on security can be incorporated into the regional context. The role of and importance of maintaining and implementing Article 9, the peace clause in Japan's constitution, was also noted by several participants, as well as the importance of connectivity and economic development, and the need for civil society organisations to closely monitor territorial disputes in Asia, including dormant ones. Particular attention was paid to the priority issue of denuclearization, including various perspectives on the very definition of this term, how civil society can contribute to an environment conducive to the establishment of a Northeast Asia Nuclear-Weapon-Free Zone. Participants emphasised the need to work out measures to prevent further nuclear proliferation, as to prevent is always better than to react. Further discussion was held on how to utilise the Treaty on the Prohibition of Nuclear Weapons (TPNW), adopted at the United Nations in 2017 and for which the International Campaign to Abolish Nuclear Weapons (ICAN) was awarded last year's Nobel Peace Prize. In addition, cross cutting themes including the involvement of youth in activities for peace and security in the region, and the vital role of women, and the need for gender equality in order to ensure a true and sustainable peace for the Korean Peninsula, were also highlighted. Through this meeting, it was emphasised that peace on the Korean Peninsula and in Northeast Asia is of urgent importance not only for the region, but for the world as a whole, and that the GPPAC Global network is committed to make utmost efforts to support this. Participants confirmed that they will continue to utilise the space provided by GPPAC, and strive to make more concrete steps to contribute as civil society to peace. A broad range of activities and initiatives were proposed by participants, to be followed up and confirmed as both the 2019 Action Plan for GPPAC Northeast Asia, as well as mid-longer term goals for the region. These included concrete next steps for the Ulaanbaatar Process including the annual meeting and establishment of key thematic working groups; broadening the process to include more involvement from the United States and Europe, as well as more women and youth. Numerous initiatives to support the international call for the implementation of existing agreements was made, including mechanisms for joint advocacy and statements at times of key events and developments related to peace on the Korean Peninsula. In this relation, dates including the 100th Anniversary of the March 1 independence movement, the April 27 first anniversary of the Panmunjom Declaration, and the May 24 International Women's Day for Peace and Disarmament were referenced, as but a few examples. Utilising GPPAC's global network for broader advocacy at the EU and in the United States will also be considered. The need for more efforts to foster civil exchange and mutual understanding with the DPRK was emphasised, and proposals will be developed for peace delegations, seminars or meetings in Pyongyang, and collaboration with influential figures will be pursued. Follow up discussions will be held throughout the remainder of 2018 in order to finalise the regional action plan and concrete steps to contribute as civil society organisations to peace on the Korean Peninsula and in Northeast Asia.